Reveal the wave nature of sound with this unique kit. 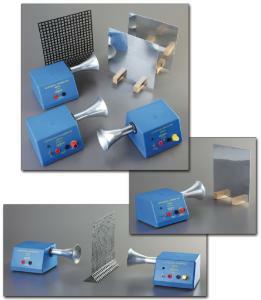 This kit demonstrates a direct analogue of the properties of electromagnetic waves through a receiver, transmitter, and transducer. Supplied with exponential horns, the unit also includes two reflectors and a perforated plate to support investigations of reflection, interference and diffraction of sound. Its Ultrasonic Transmitter generates a 40kHz signal, which is fed to the transducer cell and also to 4mm sockets panel of the unit. This lenables a second transducer to be driven simultaneously, providing an in-phase double point source for interference experiments and more. Facilities are also provided for modulating the output of the transmitter using an audio signal generator. The Ultrasonic Receiver features identical dimensions to the transmitter, but in this case it is used as a detector - its output being applied to a DC amplifier circuit. A pair of 4mm sockets allow connection to a 1mA meter for quantitative work. And, a gain control is also provided so that the output from the receiver provides full scale deflection of the meter under maximum signal conditions. Similar to the transmitter and receiver, but containing only a transducer cell, the included Transducer is designed to be connected in parallel with the output from the internal oscillator of the main transmitter to produce an identical output allowing experiments in double point-source interference and more. Unit requires two PP9 9V batteries, not included.